Seven notorious robbers believed to be disturbing the peace of Enugu in the last one month have been arrested in different locations by the police. 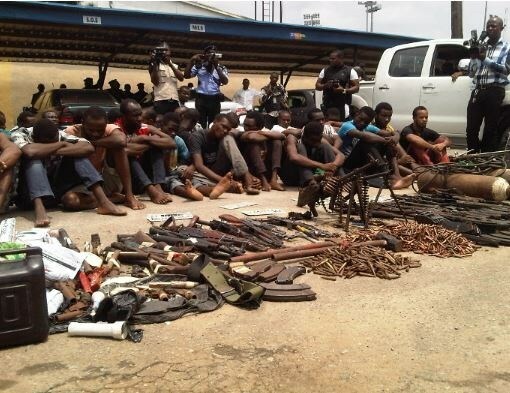 The state’s Police Public Relations Officer [PPRO], Ebere Amaraizu, said the suspects were arrested in Lagos, Anambra, , Ebonyi and Enugu states. The arrests Amaraizu said was the result of the Anti-Kidnapping Unit’s painstaking intelligence operation. He said that the highly specialized robbery gang had killed one Chinedu Nzegwu, a trader and a policeman at Obioma Street in Uwani, Enugu on Sept. 12. The suspects are Obunike Ugbene, 27, alias Paparazi, who is the ringleader of the gang from Amaofiagu in Affa of Udi council area of the state but residing at Obinagu road Abakpa Nike near Enugu. Kenneth Uchenna, 27, alias Madubuagu, who is a highly skilled driver from Imezi Owa community in Ezeagu Local Government; Nkemdilim Mathew, 23, alias Alone from Nodu-Okpuno Awka of Anambra; and Chukwuma Mbam, 22, alias revolution from Ikwo in Ebonyi. Stanley Uchenna, 23, alias Posiga from Aguobuowa in Enugu State, who acts as informant for the gang; Chinedu Mbam,25, alias Nwaiboko from Izzi in Ebonyi and Patrick Okoli, 33, alias Chika Tokor from Obunofia-Ndiuno Ezeagu in Enugu State’’. Amaraizu said that the gang leader, Ugbene, had regretted the killings and prayed God to forgive him as he never intended to kill anyone but circumstance led him and the gang to do that. He noted that the gang leader had confessed and revealed to police operatives their numerous operations, the locations where they had operated in the state and number of people they had killed so far. Through intelligence information, the gang leader was nabbed in Lagos by the operatives of the Anti-Kidnapping Unit where he had escaped to and his arrest facilitated the arrest of other members of his gang,’’ he said. Amaraizu noted that the gang leader, Ugbene, while regretting his action, advised youths to desist from involvement in any criminal activities as “there is no peace for any criminal and no matter what, he must be caught’’. The Commissioner of Police in the state, Mr Mohammed Danmallam, applauded the Anti-Kidnapping Unit and promised that the command would partner with sister security agencies to ensure that peace and security in the state was sustained. Danmallam maintained that the command would keep on being proactive in line with the tenets of community oriented policing. The commissioner said that any crime committed must be followed and suspect or suspects must be unmasked.